Located in the north-central part of Switzerland, Zurich is the capital of this magnificent country and one I personally think should be on your travel bucket list. Let’s explore together in this edition of Foodie Travel Guide to Zurich, Switzerland! As we walked the streets of Zurich, we realized why this city is always on lists of “best cities to live in” or “best quality of life city”. The city breathes a different air: cleaner and crisper than what we had experienced in other countries like France or Italy. Hands down the cleanest city we have visited, Zurich is a destination if you’re looking to experience elegance, the arts, and overall, a relaxing time walking the streets of this incredible city. We arrived in Zurich by train, like almost 70% of all visitors that come to the city do. 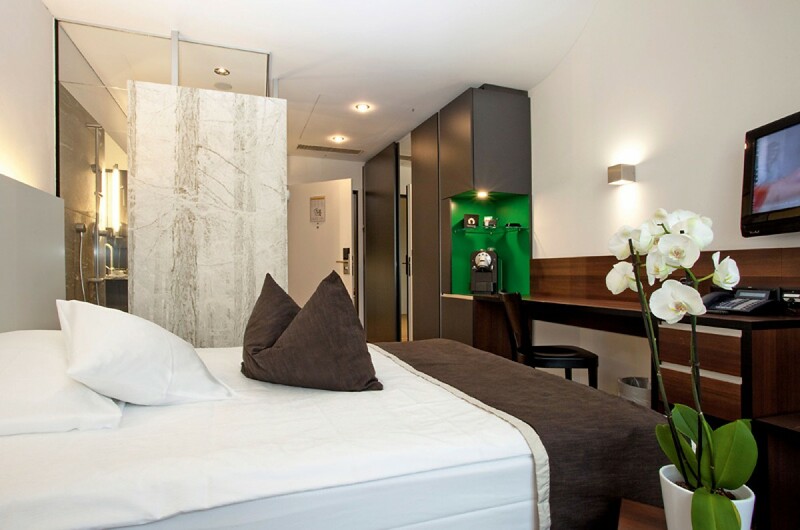 When booking a hotel, we wanted to experience what the city was all about and searched for ones with great location, stumbling upon the Glockenhof Zurich. With it’s prime position in the heart of the city with the famous Zürcher Bahnhofstrasse (shopping street) a few steps away and the banks of Lake Zurich a couple of minutes on foot, this hotel is perfect if you’re in the city for a couple of days and want a centralized location, pristine rooms, and great service. Two acclaimed restaurants, a contemporary hotel bar and a boulevard café as well as one of the nicest outdoor restaurants in the city, this hotel was a favorite of ours – and with 91 stylish, air-conditioned rooms with full amenities and comfort, I definitely recommend it! Zurich is hands down one of my favorite cities in the world and getting to explore it for 4 days, 3 nights was a dream come true. If you’re a lover of all things bread, baked goods, beer, and good food – this city is for you. Since we were in Zurich for a few days, we wanted to take it easy on our schedule, so we made sure to have leisurely mornings when we would get up a little later than usual and have breakfast at the hotel. It was seriously one of the best parts of the day, because the breakfast at our hotel was incredible – from cheese platters to the freshest nuts and seeds, fruits and vegetables, along with egg dishes and charcuterie, breakfast at the Glockenhof Zurich was surreal. After feeling satisfied from breakfast and ready to take on the day, we decided to check out the Uetliberg Railway Station + Mountain for half a day. The Uetliberg is a mountain in the Swiss plateau, rising to 870 m (2,850 ft). The mountain offers a panoramic view of the entire city of Zürich and the Lake of Zurich, and lies on the boundary between the city of Zürich and other municipalities. Easily accessible by train which take off every 30 minutes and take only 20 minutes to reach the top, it’s a one way to do it. We decided to start off by hiking the walking trails first and then took the train on the last stretch, to also experience that. Once you arrive, there is a hotel along with some viewing towers, so we rewarded ourselves with pretzels and beer at the Hotel Uto Kulm. As you can see, the pretzels and beer were divine, but even more impressive was the view! The panoramic views are so outstanding that you’ll want to stay up there for hours just contemplating them. But we had other places to see and Zurich was waiting for us to head back down and keep exploring the city at a lower elevation! Regional provenance, freshness and sustainable production are very important to the people of Zurich, so it is vital that local restaurateurs deal with issues such as fair trade, organic production and food waste. Customers are particularly appreciative if, for example, a menu states that its organic beef is sourced from a local farm or that the salad uses herbs grown in the immediate vicinity. So standards are very high in most Zurich restaurants, and food tastes all the more delicious when made from regional products. 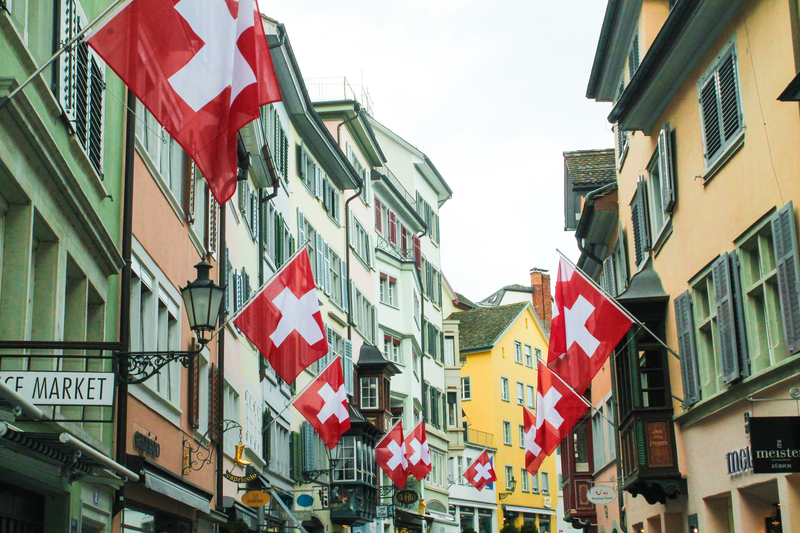 We discovered this to be true everywhere we went, from produce markets to coffee shops – whether they sourced from just a few miles away or anywhere else in the country of Switzerland, the menus themselves were comprehensive guides to what was offered. Zurich is an international trendsetter for vegetarians and vegans too. After all, it can boast the oldest vegetarian restaurant in the world – Haus Hiltl, which dates from 1898 and serves vegetarian and vegan dishes from all over the globe. So if you’re vegan or vegetarian, Zurich is a safe haven for that! Granted, we dined on a lot of local meats while visiting, as we weren’t yet on that plant-based lifestyle, but it was still appreciate that the local meat industry really focuses on organic meats. On our itinerary, we set off to meet with Food Zurich and their guide, who took us to lunch to explore the Im Viadukt, home to markets, food shops, and restaurants. IM VIADUKT was planned as a meeting place for citizens of the district and its visitors and it achieves just that – because if food is the center of something, people will surely congregate and meet there, as did we. Ragoût of beef, beluga lentils, marrow bones with fleur de sel plus a thousand more culinary creations. We had lunch at Restaurant Markthalle, where your appetite for authentic cooking with seasonal ingredients produced locally wherever possible is absolutely satisfied. The Mediterranean-inspired dishes are not only cooked in a market atmosphere, but it’s a fun spot to hop around and try a variety of things. Zurich is already a magnet for food lovers. 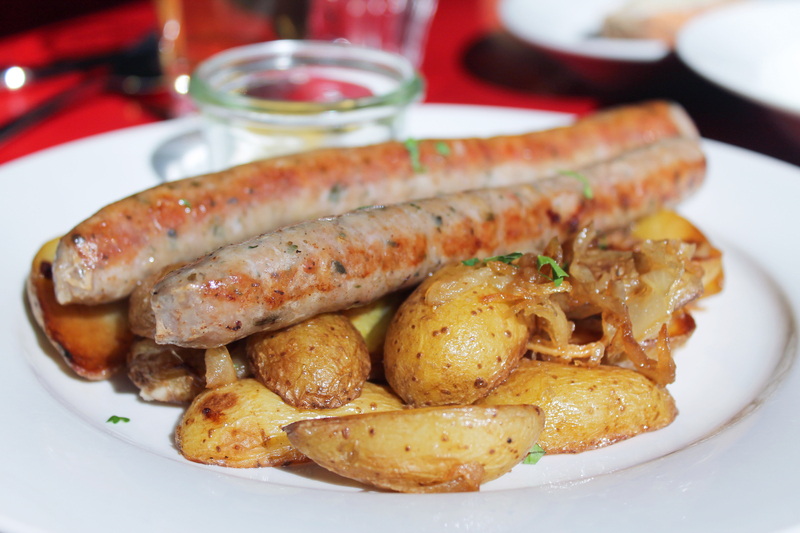 From upscale gourmet cuisine to Swiss classics and exotic street food: the locals love food and are real gourmets. 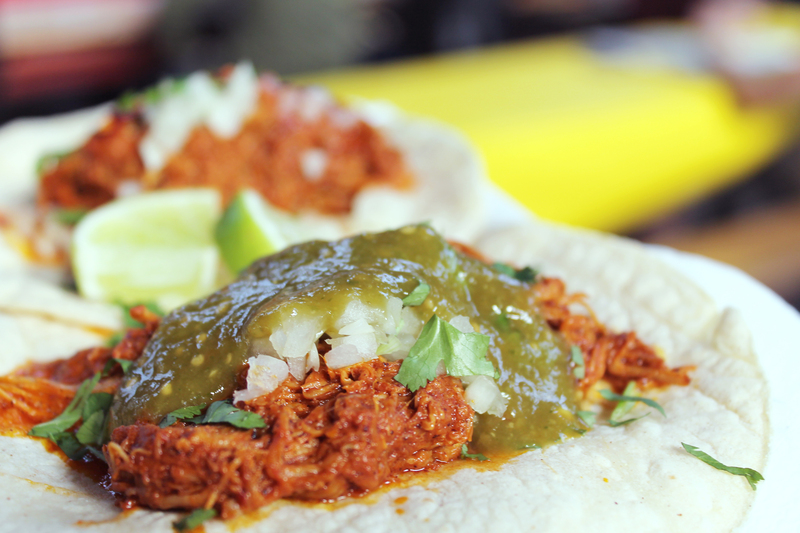 A diverse range of culinary festivals have become increasingly popular in recent years. FOOD ZURICH, sponsored by Zürich Tourism and its partners, offers a joint platform for all these events and has really put the city on the culinary map – and on the travel itineraries of foodies and gourmets. The flagship initiative from Zürich Tourism and its partners is an 11-day feast featuring more than 70 culinary events. And sometimes, it’s all about luck. For example, the last thing I’d ever think of having in Zurich were the perfect authentic tacos as seen above, but on a lucky day while traveling in the city, we decided to stop into the train station to exchange some money and eureka! We discovered Streetfood Market at the Zürich Hauptbahnhof, the largest railway station in Switzerland and thus the perfect place to showcase and serve a variety of food. We had everything from authentic Mexican tacos and salsas, to Korean pork belly steam buns, to Kürtőskalács, a spit cake specific to Hungary and Hungarian-speaking regions in Romania! Luxemburgerli from Zurich are light and airy and unbelievably scrumptious. The story of how this mini-macaroon came into being is enshrouded in legend. According to the confectionery company, Sprüngli, Richard Sprüngli discovered this sweet treat in Luxembourg. As a young confectioner – and manager in the fifth generation of the Confiserie Sprüngli at Paradeplatz – he traveled the world to gain experience, and probably came across this delicacy during this time. On his return to Zurich, Richard Sprüngli and his team set about producing this mouthwatering confection themselves. Over the years, the recipe was refined so that it was smaller, lighter and even more airy than its rival products abroad. 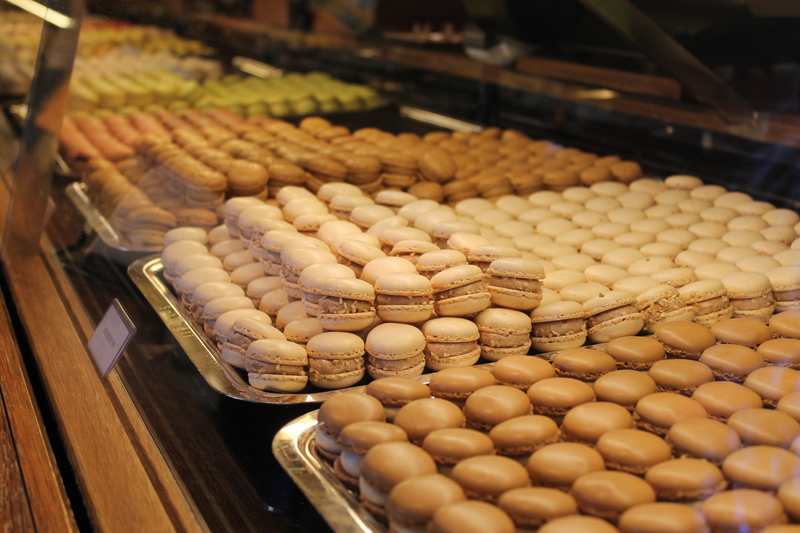 With its convenient bite-sized shape and delicious cream filling, the Luxemburgerli – as this mini-macaroon became known – soon conquered the hearts of the people of Zurich – and also those of the tourists visiting the city. Nowadays, it is hard to imagine Zurich without Luxemburgerli. And the basic recipe is still as strictly guarded as a state secret. As you all know, being connected is important to me so that’s why we reached out to Traveler’s WiFi in Zurich and decided to partner with them while we were there. Not very common in the USA, these pocket wifi devices are heaven sent when traveling internationally! You rent them for unlimited high speed internet while in Switzerland and they make it so easy! We told them the hotel we would be checking into and upon arrival, it was waiting for us there, so instant wifi as soon as we started exploring the streets if Zurich. And once you are done, you just return it to any post office or any of their there locations (super easy to find) and you’re set. Honestly, this was something we didn’t think we’d need but after the first hour of being out, we realized it was essential for all our mapping, sharing photos, and social media posting! I recommend this 100% when you’re there – it makes traveling so much more fun when you can share with friends and family instantly! Overall, if you’re looking for a European getaway that’s fueled by clean air, incredible local food, and some of the best nature walks and cityscapes, Zurich is your city. A huge thank you to the Zurich Tourism Offices as well as our host hotel for the attentions – we can’t wait to be back! Disclaimer: We paid for our own travel to and from Zurich and the hotel graciously extended a media rate for our rooms. Traveler’s WiFi lent their device complimentary to us, but our opinions are our own and we only recommend things we have tested and loved! Thank you for supporting companies that help us bring you amazing content.